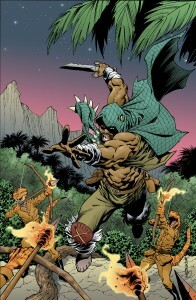 Turok #5 Cover: How I did it! 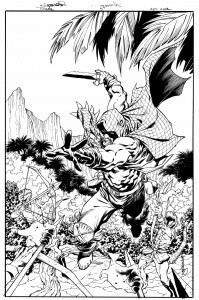 My short run of Turok covers for Dynamite is over with issue #5. 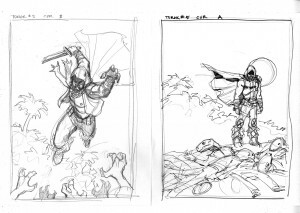 I did enjoy working on these even though they are not “classic” Turok. Let’s face it: “anyone” Dinosaur Hunter is cool. 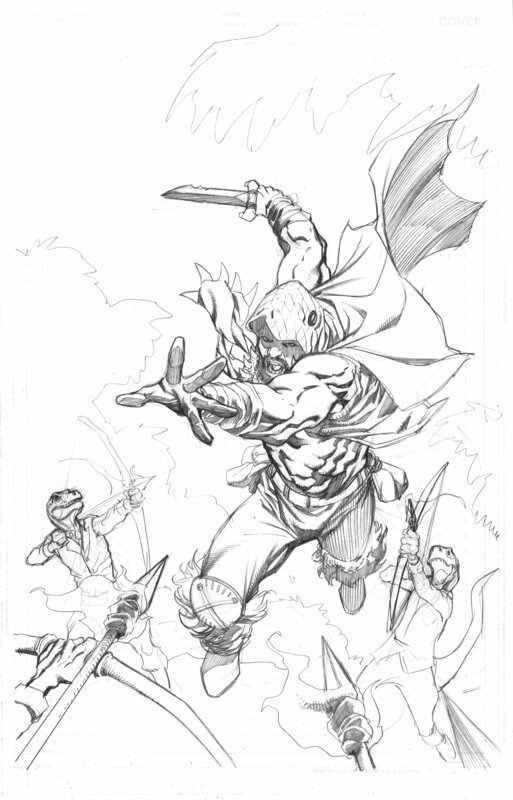 So here is the breakdown for my final Turok cover. I actually had more than one idea for this cover so in a rare dislpay of goodwill, I did two cover roughs for this issue. I kind of liked “A” best, so of course, they chose “B”. Better shots of the dinosaur men shooting flaming arrows was requested and I obliged. For some reason I inked Turok before I actually finished the detailed pencil work on the dinosaur men, which is why they seem unfinished in the pencil scan. I did more detail, some of which I added in the inking. 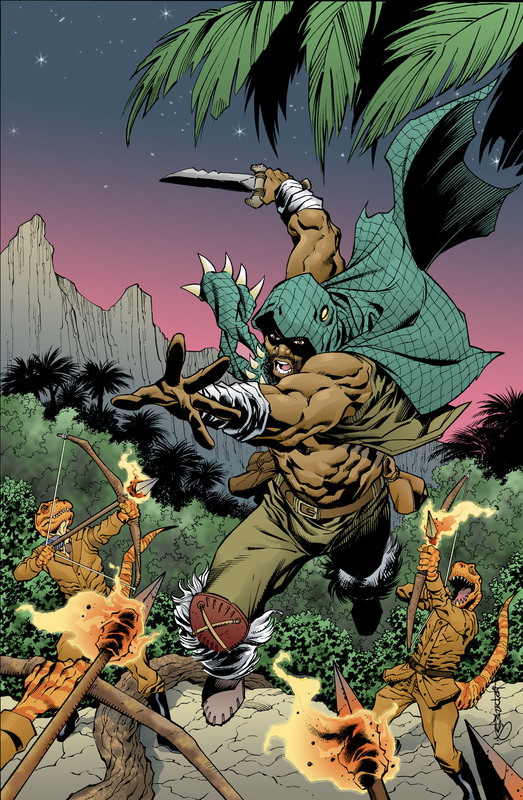 I was pleased with the strong central image of Turok. (which is really all that matters, I suppose) The mid-ground area might be a little too open upon further review but I like to leave space around smaller characters so they don’t get lost in the background. I am also overly cautious about making sure that smaller background characters’ actions are clear (in this case shooting bow and arrows). I scanned the black and white image at 1200 dpi (bitmap or “line”) and then converted it to CMYK and colored it in photoshop. 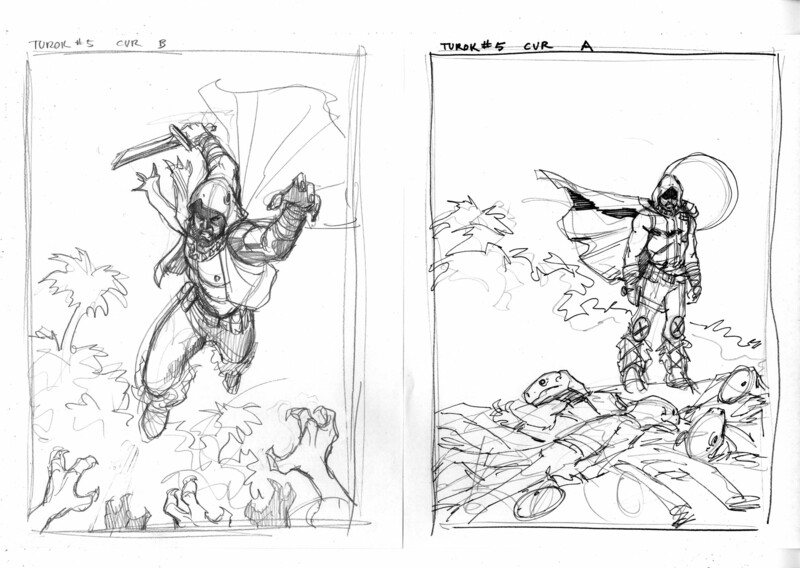 On many of these covers, I am never quite sure what I am going to do with the backgrounds. I originally saw this as a day shot but after I messed around and tried a night time or evening sky effect, I really liked the color and feel of it. So I used one of the photoshop brushes to created the stars and called it a success. 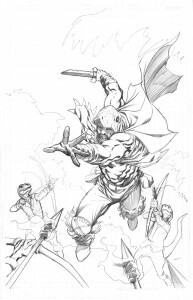 Next time we’ll take a look at my Wonder Woman/Conan #3 cover which presented some new challenges for me. Until then….